One spring, I determined to paint every wildflower in the local Missouri Natural Area as it bloomed. I took my paints in my old vintage metal watercolor box, my backpack full of supplies--including a WWII canteen that serves as my water container--and climbed the steep hill with its limestone outcroppings. I stopped when I found this perfect little flower silhouetted against the dark background. 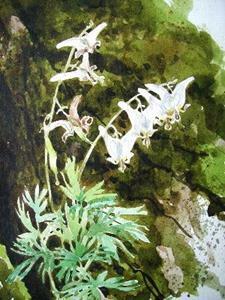 It was one of my mother's favorites--Dutchman's Breeches, for the little white pantaloon-like flowers hung out to dry. I had taken no liquid mask with me, so I just slowly and carefully painted around the delicately cut, fernlike leaves and the fine stems and translucent petals. It was almost meditative, the hours I spent there...but I quickly bogged down in the burgeoning of spring's riotous growth!